Chloe Kallistrate is a Vampire Hunter. Born from the blood of angels and gods, she finds that being a Hunter isn't something you learn, it is something you are ... whether you like it or not. 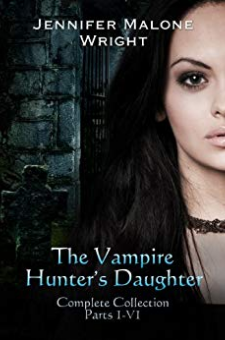 After losing her mother one horrible night, she is thrust into a world of vampires and those that hunt them, a world where she isn't sure she belongs. Tragedy forced this life on her, but the answers she seeks about her mother lie in the grandfather she's never met before. The trouble is, what she discovers could mean that she has to kill the very thing that created her. The Vampire Hunter's Daughter is a novella series with six parts. The Arcadia Falls Chronicles (Currently ten books) is the continuation of The Vampire Hunter's Daughter story and contains the same characters, as well as following the same story line.